Blended together on 78 acres bordering Michigan’s longest river is a bit of nature, a lot of history and a riverbank lined by 270 million-year-old sedimentary rocks that are the most impressive cliffs in the Lower Peninsula. Fitzgerald County Park is best known as the home of the “Ledges” — ancient sedimentary rock outcroppings lining the Grand River — but the park offers a wide range of facilities, even a nature center, and year-round recreational opportunities. 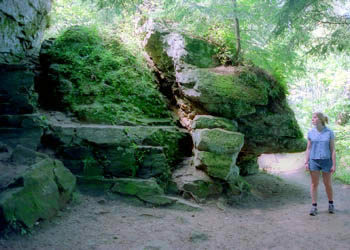 The Ledges have attracted people to the area throughout history, beginning with Chief Okemos, a legendary Indian who led his tribe to the river of the "Big Rocks" each spring to hunt and tap trees for maple syrup. Later the area was known as Robbers Caves, since the many caves at the base of the ledges were supposedly used by thieves to stable stolen horses while they awaited sale. Other legends tell of fugitive slaves using the caves as part of the Underground Railway in their flight to freedom in Canada. By 1894 the beauty if the Ledges had attracted a religious group who established the Grand Ledge Spiritualist Camp Association. Within Fitzgerald Park, they constructed a large pavilion and organized a camp that brought thousands here at the turn of the century for "summer encampments." The pavilion that the spiritualists originally used for séances was later used for a factory, roller-skating rink, and basketball court, successively. Today, it's the big red barn in the park and serves as the home of the Spotlight Theater. Much of the park is developed with facilities that range from softball diamonds and basketball courts to an 18-hole disc golf course and six picnic areas. But a good percent of the park has been left in its natural state and is accessed by 3 miles of foot trails. Fitzgerald’s best known hike is the Ledges Trail. 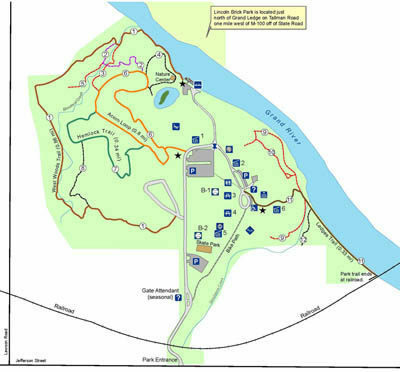 The mile-long, point-to-point trail links the county park with Island Park near the city of Grand Ledge, skirting the base of the famous cliffs along the way. The rest of the park’s trail system is a series of short, interconnecting paths that can be picked up at the nature center trailhead or a trailhead adjacent to the main parking lot. The longest is the West Woods Trail that is almost a mile in length and includes a stretch along the Grand River. The most unusual is Green Earth Recycle Trail, an interpretive path with 10 stops that focuses recycling. The trails are open year-round and in the winter cross-country ski and snowshoe are available for rent from the park office. Fitzgerald offers six picnic areas with shelters, softball fields, volleyball and basketball courts, horseshoe pits, a play area and an 18-hole disc golf course. 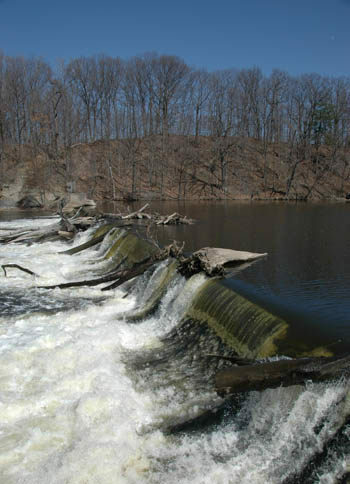 The park also has a canoe launch near the Grand River dam and offers canoe rentals from Memorial Day through Labor Day and weekends in October. 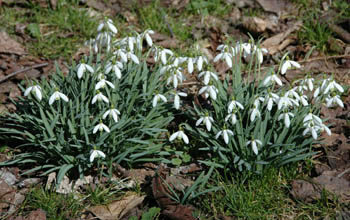 The park’s small nature center offers naturalists programs throughout the year. The park is open year round from 8 a.m. to dusk. A motor vehicle entry fee is required from April through October. From I-96, depart at exit 93-A and head west on M-43 for 6 miles. Turn right on Jefferson Street and the park entrance will be a half mile on the left.